The new diesel-electric attack sub is expected to join the Russian Pacific Fleet by 2020. The Admiralty shipyard in Saint Petersburg has floated out its first improved Project 636.3 Kilo-class (aka Vashavyanka-class) diesel-electric attack submarine (SSK), the Petropavlovsk-Kamchatsky, destined for service in Russia’s Pacific Fleet, on March 28. Russia laid down the first two out of six planned improved Project 636.3 Kilo-class SSKs for the Pacific Fleet in July 2017. The Petropavlovsk-Kamchatsky and the Volkhov were slated to join the fleet in 2019 and 2020. However, as I reported elsewhere, the dates have been pushed back to the end of 2020 and 2021, respectively, due to funding issues and construction bottlenecks. The Russian Navy originally intended to field a fleet of six Lada-class attack submarines. 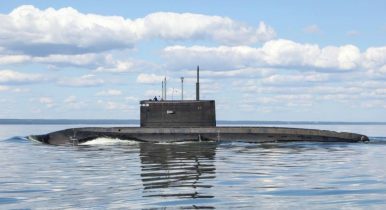 However, up until now only one submarine, the St. Petersburg, laid down in 1997, has entered service with the Russian Navy. While funding for one more Lada-class attack, the Velikiye Luki, has been secured, contracts for the fourth and fifth boat of the class are only expected to be signed in 2019. There is reason to believe that construction of the class will cease after the handover of the Velikiye Luki. The Project 636.3 Kilo-class is an improved variant of the original Project 877 Kilo-class design. The updated version is slightly longer in length — the sub’s submerged displacement is around 4,000 tons — and feature improved engines, an improved combat system, as well as new noise reduction technology. For example, the submarine reportedly boasts a special anechoic coating applied on the outer hull surface to reduce noise emanating from its interior. Additionally, the sub’s main propulsion plant is isolated on a rubber base preventing vibrations that can be picked up by enemy submarines. However, the submarine class lacks a functioning air-independent propulsion system, which reduced the boats’ overall stealth capabilities. Notably, the SSK can be deployed for land-attack missions. Project 636.3 subs have attacked land targets in Syria with M-54 Kalibr (NATO designation: SS-N-27A “Sizzler”) cruise missiles in past years. Two new diesel-electric attack submarines are expected to be handed over to the Russian Pacific Fleet by November 2020.